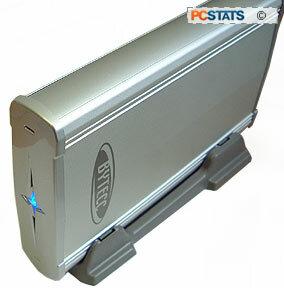 Abstract: Bytecc ME-350US apart is the significantly more compact size, external power brick, and smooth aluminum chassis. The enclosure I finally found was big, beige, and pretty ugly, but with that USB2.0 connection round back, it got the job done mighty fast. In this review we'll be looking at a little more stylish hard drive enclosure which does pretty much the same thing as the big ugly unit we last tested. What sets the Bytecc ME-350US apart is the significantly more compact size, external power brick, and smooth aluminum chassis. The jury is still out on the little blue LED at the very front of the drive, but everything else is in order, and configured fairly neatly. 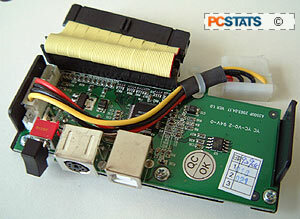 Aluminum enclosure and parts, stand, USB2.0 cable, power adaptor and plug, small driver CD for Win98/98SE computers. The Bytecc ME-350US ships unassembled, and so it take five or ten minutes to install the hard drive (which you must provide separately, no drives are included in the kit) from scratch. Installation is dead simple; the hard drive is connected up to the 80-pin IDE cable and molex power connector, and the entire assembly is slid into the one-piece aluminum chassis. 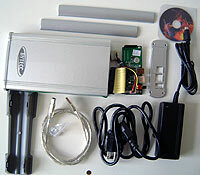 The hard drive is secured to the aluminum chassis with 2 or 3 screws along either side, and then the electronics package (the IDE to USB2.0 converter) is slid into the enclosure and screwed in place with a couple of very small self tapping screws. The circuit board is protected from short circuiting against the aluminum chassis by ways of a plastic support, to which the screws actually sink into. With everything inside the unit all snug as a bug, a set of dovetailed covers slide into place on either side of the aluminum enclosure, and are capped off by a final back plate which is screwed into place as well. When it's all said and done, the Bytecc ME-350U2 locks the hard drive behind at least three sets of screws, and provides a very clean, and very compact housing for the drive itself.